What would it take to get Brits to send their food back? January 05, 2018, 9:13 a.m. Listen closely enough in any British eaterie and sooner or later you will doubtless overhear someone quietly complaining about their food to their dining companions, only for them to declare everything is fine to any serving staff who ask how their meal is. 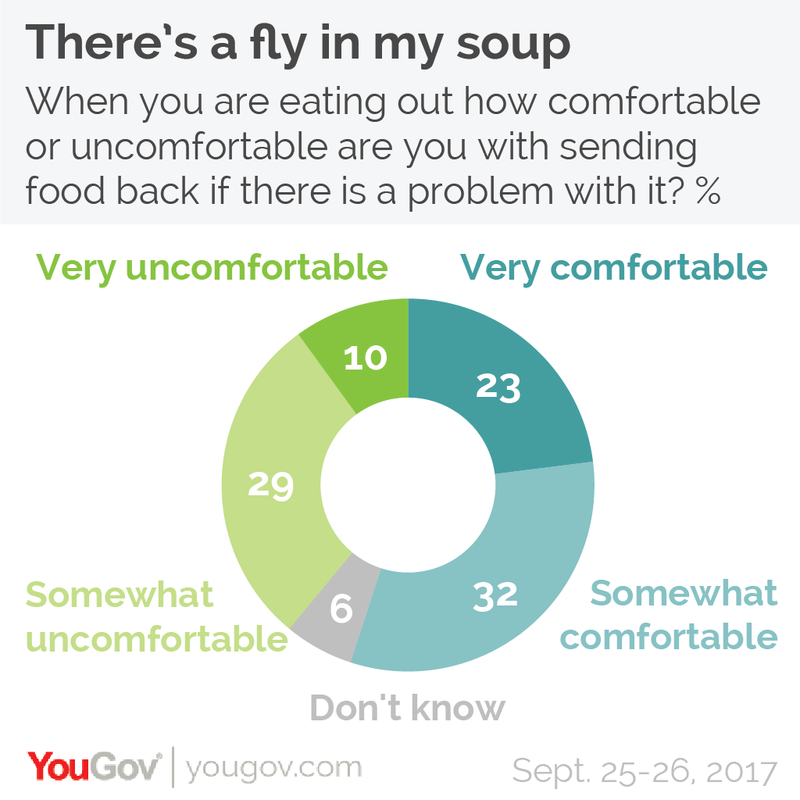 Now new research from YouGov Omnibus reveals how reluctant many Brits are to complain about problems with their dining experience. 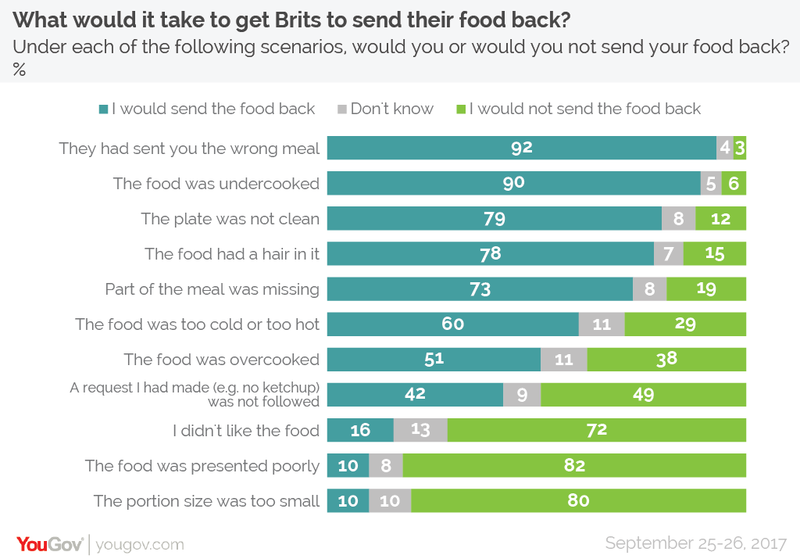 The results uncover that as many as four in ten Brits (39%) say they would feel uncomfortable sending food back if there was a problem with it (including 10% who would feel very uncomfortable). Nevertheless, the majority of Brits (55%) say they would not be phased by having to complain about their food. On those occasions where people are confronted with a problem with their meal, 38% of Brits are generally assertive about the issue, saying they send food back every time or most of the time. A further 21% send it back some of the time, while 34% say they only rarely or even never complain. Among those who are uncomfortable with sending food back, this final figure rises to 49%. That isn’t to say that those who feel uncomfortable sending food back are pushovers, however. 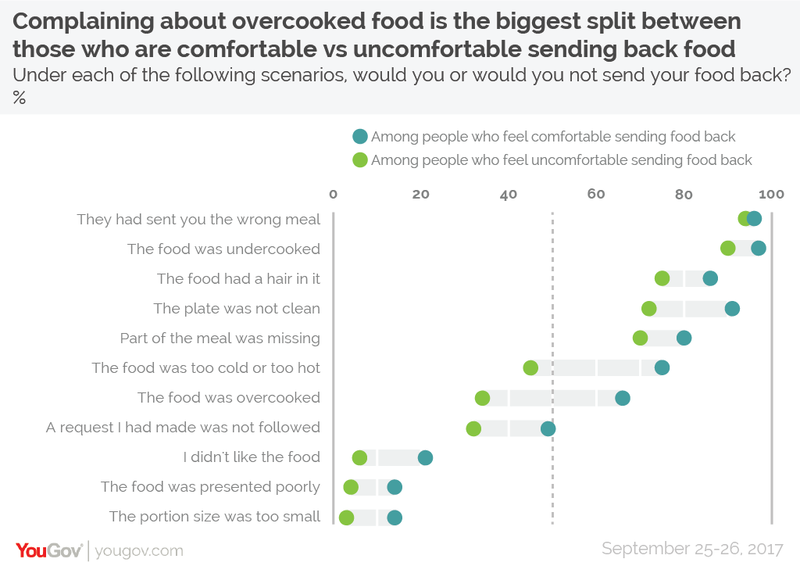 YouGov put 11 imperfect-food scenarios to people and asked whether they would or would not send the food back in each instance, and in five the majority of those who don’t generally feel comfortable returning food to the kitchen would be willing to speak up for themselves. Brits are most likely to send food back if they had received the wrong meal (92%, including 94% of those who are uncomfortable sending food back) or their food was undercooked (90%, including an identical proportion of those uncomfortable sending food back). At the other end of the scale, Brits are least likely to kick up a fuss if their portion size was too small (10%), their food was poorly presented (also 10%) or they didn’t like the food (16%). Among those who are uncomfortable sending food back these figures were 3%, 4% and 6% respectively. The biggest differences between those who are comfortable/uncomfortable sending food back are over overcooked food and food being too hot or cold. 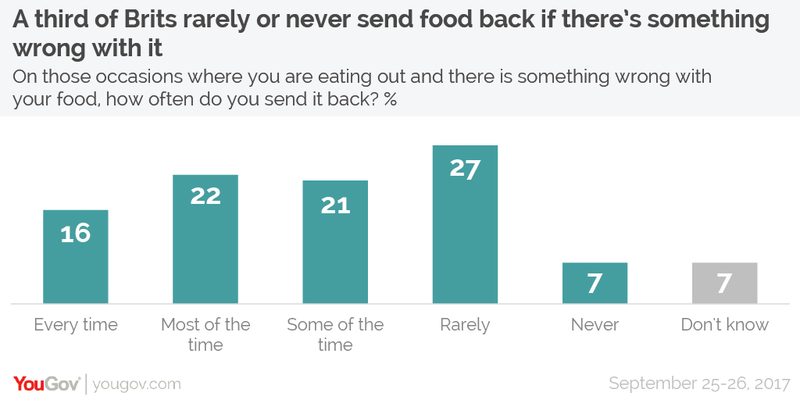 Two thirds (66%) of people who say they are comfortable with sending food back would send back overcooked food, compared to just 34% of those who find sending food back discomfiting (a difference of 32%). Likewise, three quarters (75%) of people who aren’t put out by returning food would send back food for being too hot or cold, compared to 45% of those who find it uncomfortable (a difference of 30%).